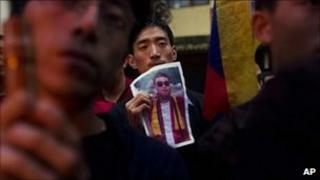 A Tibetan monk has burned himself to death in China's Sichuan province, in an apparent anti-Beijing protest. Activists said the monk, whom they named as Tsewang Norbu, had shouted slogans including "long live the Dalai Lama" before setting himself alight. A similar action sparked weeks of confrontation earlier this year in another town in Sichuan. Unrest is fuelled by a widespread belief that the government is suppressing Tibetan culture. The argument has been going on for decades, with many Tibetans accusing the government of forcing monks to attend re-education camps, encouraging the migration of Han Chinese to Tibetan areas, and crushing any sign of dissent. But the authorities say they have brought relative wealth and prosperity to a region that was a rural backwater. The group said he had been calling out "we Tibetan people want freedom", "long live the Dalai Lama" and "let the Dalai Lama Return to Tibet". Most Tibetan monks are loyal to the Dalai Lama, the spiritual leader who has lived in exile in India for decades. A local hotel receptionist told the AFP news agency the monk had been handing out leaflets before he set himself alight. "I saw a monk lying on the ground and burning, he died right in front of the county government building," said the receptionist. The local government has promised to investigate, saying it was not clear why he had set fire to himself. In March, a monk set light to himself in Aba, about 100 miles (150km) from the latest incident. Local people accused the authorities of locking down that monastery and carting off monks to be re-educated. The UN later said up to 300 monks may have been illegally detained.